No more messy liquid glues or yellow dots! 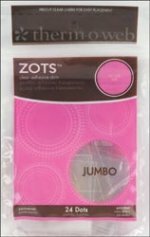 Zots Memory Adhesive Dots are high-tack, crystal clear and acid-free. Small, Medium and Large are paper thin making them nearly invisible and will add dimension to all kinds of paper craft projects. Glubers Clear Adhesive Dots 12/Pkg 2"